Our primary geographic coverage is the West and South sides of Mount Hood. However, we are regularly called to search and rescue events in the foothills of Mount Hood near Estacada, Oregon, and other high angle areas of Clackamas County, Oregon. 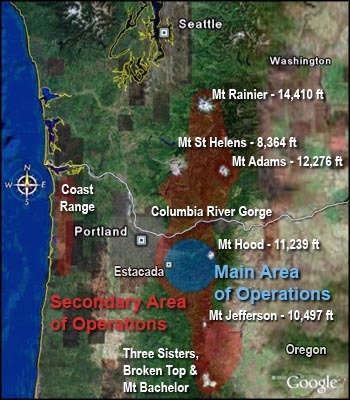 Occasionally, PMR is called in to high angle areas of the Oregon Coast Range, Western Columbia River Gorge, Multnomah County, Oregon, and Skamania County, Washington. We are also asked to assist other search and rescue units in Central Oregon and Western Washington. These areas include large Cascade Range mountain peaks from Mount Rainier near Seattle, Washington, to Mount Bachelor near Bend, Oregon. When needed, PMR stands ready to provide assistance to Pacific Northwest search and rescue (SAR) units outside of our main and secondary areas of operation. When necessary, other SAR units will assist PMR missions in our operations area.